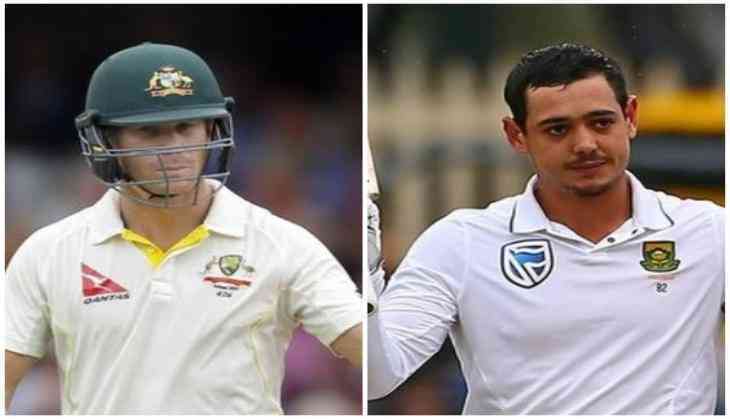 Australian swashbuckling batsman David Warner and South African wicketkeeper-batsman Quinton de Kock were engaged in a brawl at tea session on the fourth day of the Durban Test on Sunday. The CCTV footage, which was taken from the players' tunnel at the Kingsmead, showed the players from both the teams making their way to the respective dressing rooms during the tea session. Subsequently, Warner and de Kock could be seen involved in a heated exchange. The confrontation was so severe that Australian wicketkeeper Tim Paine had to calm Warner down, while batsman Usman Khawaja held him back. Ultimately, skipper Steven Smith had to whisk him away from the scene. It is yet to be ascertained as to what caused the provocation. A Cricket Australia (CA) spokesperson was quoted by news.com.au as saying, "CA is aware of reports of an incident between players in Durban. CA is working to establish the facts of what has occurred and will not be commenting further until that has been done." It was the second heated incident involving Warner, who, along with Nathan Lyon, could be scrutinised over their conduct in celebrating the run-out of AB de Villiers earlier in the day. Aiden Markram and de Villiers were involved in a mix-up, as Warner threw the ball fiercely in the direction of Markram. This caught the 34-year-old de Villiers off guard and was ultimately run out by Lyon. The Australian spinner then grazed past a sprawled-out de Villiers after whipping off the bails at the non-striker's end and dropped the ball right in front of him, as he raced to join Warner and the rest of the players in wild celebrations, according to Sydney Morning Herald. Warner's comments were not picked up by the stump microphones. However, he and Lyon could be in deep trouble, if match officials believe that they breached article 2.1.7 which relates to "using language‚ actions or gestures which disparage or which could provoke an aggressive reaction from a batsman upon his or her dismissal during an international match". This was not the first time that Warner has been involved in getting fired up against the South Africans. During the Test series in 2014, the left-handed batsman was fined by the International Cricket Council (ICC) for questioning whether then Proteas captain de Villiers had tampered with the ball during a radio interview after the second Test in Port Elizabeth. In the third Test at Cape Town of that series, he slammed the comments of batsman Faf du Plessis, after the latter had allegedly described the aggressive Australians as like a "pack of dogs" in the field. Australia is on the brink of taking the lead in the four-match Test series after reducing South Africa to 293 for 9 at the end of day four's play at Kingsmead in Durban. Australia and South Africa's first innings scores read 351 and 162 respectively.